As a general rule, when SAS programmers want to manipulate data row by row, they reach for the SAS DATA step. When the computation requires column statistics, the SQL procedure is also useful. When both row and column operations are required, the SAS/IML language is a powerful addition to a SAS programmer's toolbox. I was reminded of this fact recently when a SAS programmer (possibly a student) asked how to "manually" perform the classic chi-square test for association in a two-way frequency table. The computation requires computing the means across rows and down columns, and the student was struggling with implementing the computations in the DATA step. This article illustrates how SAS/IML can simplify the rowwise and columnwise computations in the classic chi-square test. In the eye-by-hair table, each cell contains three values. The first value is the observed cell count, the second value is the expected cell count (assuming independence), and the third value is their difference, which is sometimes called the "deviation." The test statistic and p-value for the chi-square test are outlined in red. The test statistic is 20.92. The probability of observing that value from a random draw of a chi-square distribution with 8 degrees of freedom is 0.0073. Because that probability is so small, we reject the null hypothesis that hair color and eye color are independent. where nij is the observed count in row i and column j and eij is the expected count, but there is nothing like programming a formula to ensure understanding. The following steps indicate the (vectorized) computations that can be used to implement the chi-square test in SAS/IML. Use subscript reduction operators to compute the means for each row and column, and the grand mean for all cells. Use an outer product to form the table of expected values from the mean vectors. Compute the test statistic by using elementwise matrix operations. Use the CDF function to compute the p-value. Notice that the program does not contain any loops, although the formulas contain double summations over the elements of the table. This is an example of "vectorizing" the computations, which means writing the computations as vector or matrix computations rather than scalar operations in a loop. You can see that the 'Expected' matrix matches the PROC FREQ output for the expected values for each cell. Similarly, the 'Deviance' matrix matches the PROC FREQ output for the difference between observed and expected values. The test statistic is the sum of the ratios of the squared deviances and the expected values. A call to the CDF function computes the p-value. 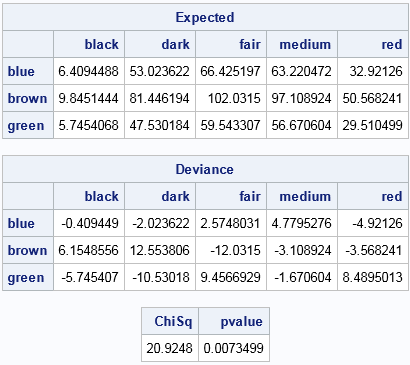 In summary, you can use the high-level SAS/IML language to implement basic statistical tests such as the chi-square test for association in a two-way frequency table. Such an exercise enables students to understand the details of elementary statistical tests. For programmers who know the statistical details but who are new to the SAS/IML language, this short exercise provides a way to gain proficiency with vectorized programming techniques. 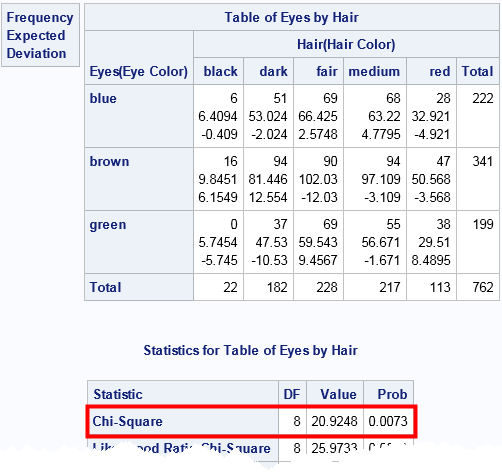 The post The chi-square test: An example of working with rows and columns in SAS appeared first on The DO Loop.